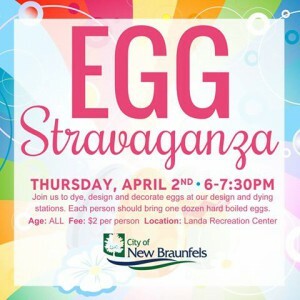 New Braunfels Park and Recreation is hosting and Egg Stravaganza at the Landa Recreation Center! Head out for egg decorating and leave the mess with them Thursday, April 2, 2015 from 6-7:30 PM! Call 830-221-4370 to register. $2 per person/decorator, bring one dozen hard boiled eggs. This entry was posted on Thursday, March 26th, 2015 at 1:46 pm	and is filed under Events, News & Updates. You can follow any responses to this entry through the RSS 2.0 feed. Both comments and pings are currently closed.